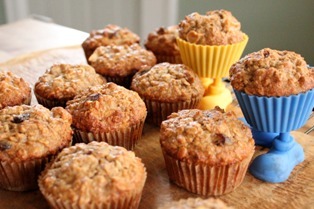 Start your day with a delicious muffins made of whole wheat and oats with apples. Try these recipe! The first thing to do is to combine in a bowl the oats and yogurt(kefir) and leave it for about 10 minutes. Then add in the apple, eggs, oil and vanilla . Combine in another bowl the sugar, flour, baking powder, cinnamon, baking soda, nutmeg and salt. Once they are combine pour the yogurt mixture over. Sprinkle it with raisins and stir. Next is to spoon the mixture into a paper lined muffin cups. Then bake it 375 degrees for 35 minutes or until the tops are golden brown. Allow the pan to cool before transferring the muffins.